The prospect of spending an entire film trapped inside a car with a miserable builder as he drives from Birmingham to Croydon isn't exactly the most tantalising of propositions. But that's what Locke offers us: one man and one location, the only action to speak of coming down the end of a telephone line. This could be a new definition of cinematic boredom. But it's not. Locke is amazing. 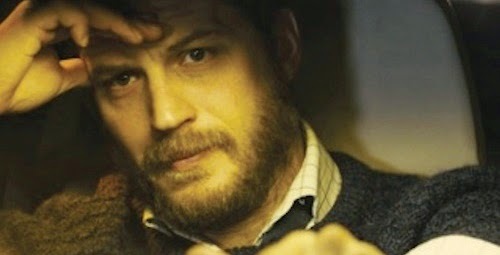 In place of scenery and locations, Locke has Tom Hardy. This turns out to be a more than acceptable trade, Hardy putting in one of the most extraordinary performances I've seen in a very long time. He plays Ivan Locke, a construction manager who's due to supervise a record breaking pour of concrete at 5am the next day. As far as concrete goes this is a very big deal, roads are being closed and hundreds of trucks are due to converge on his site for a process that we quickly realise is absolutely crucial to the success of the entire project. It's crunch time for Ivan Locke. Or it would be if he wasn't speeding in the opposite direction down the M6. Prior to this, Ivan Locke was the model of reliability - a methodical, disciplined, trustworthy man who's the exact kind of person you'd want running a multimillion pound construction job. Everything about Locke screams permanence and precision; from his measured diction to his expensive, high tech German car. A key piece of overt symbolism is his habit of leaving solid rocky concrete footprints whenever he returns from work, his wife having to chip them off the kitchen floor. But tonight this paragon of care and thoughtfulness is being put through life's mangle. One of the things I most enjoyed about Locke was slowly discovering exactly why this ordered man's life has degenerated into chaos, so I'm not going to spoil the over-arching plot. But, like a Greek tragedy, Locke's strict personal discipline inexorably drives him towards misery, every decision he makes perfectly reasonable, yet each one sending him spiralling further and further down life's plughole. "One flaw in the foundation and the entire building will collapse" just about sums up the message of the film. This resonates throughout an extraordinarily tightly structured movie. In literal terms Locke is referring to the building project he's working on, explaining to his hapless assistant Donal that everything needs to proceed absolutely perfectly or cracks will appear and the entire edifice will tumble down. Locke himself has a flaw, an uncharacteristic moment of weakness that threatens to bring his life crashing down around him. It's quietly amazing how much we learn about this character over just 85 minutes, Knight's meticulous script rapidly outlining his motivations, fears and ambitions - managing (almost in cinematic shorthand) to justify these extremely bizarre decisions. Aside from the phone conversations, the only other person Locke speaks to is his dead father. It's here, alone in the car, that he reveals the depth of his frustrations with life, desperate not to follow in the footsteps of an absent, useless father. We soon realise that every aspect of Locke's life is a reaction against his Dad, to become everything that he's wasn't. Now, as if being sucked into a genetic black-hole he finds himself, despite his best efforts, transforming into everything he hates. All this is told through a career best performance from Tom Hardy. This is an actor who's become known for hyper-masculine aggression in films; playing unhinged muscled colossii like Bane, Bronson or Bondurant. But here,in tight confines of his car there's an inescapable vulnerability to him. The car becomes a prison cell, the constant phonecalls the voices of his inquisitors, the character tortured by his memories and ethical code. There's definite echoes of Dreyer's 1928 silent masterpiece The Passion of Joan of Arc - both Hardy and Maria Falconetti's faces becoming the field on which morality and ethics do battle. Knight and his cinematographer, Haris Zambarloukis, squeeze every ounce of visual flavour from the austere surroundings. The motorway outside is a blurred tangle of fuzzy orange blips, punctuated by road works and the flash and wail of sirens. The interior of the car is always in tight focus, but the outside world has become a chaotic mess. Visually it looks as if we're seeing the outside world through teary eyes, and this visual extension of the character's internal despair goes an awful long way to lifting this beyond a mere experiment in cinema. The close attention to visual detail is ultimately why Locke works so well as a film. It's arguable that the script could have been translated to television, the stage, or even a radio play and remained effective. But there's a sense of crucial kinetic momentum here that wouldn't translate to stage or radio, and the sense of claustrophobia and time passing that would be lost on a smaller screen. For all it's audacious cinematic minimalism, Locke doesn't make huge demands on its audience. It's not boring in the slightest, it openly explains its themes and, crucially, the situation and dialogue is utterly believable. All Knight asks his audience to bring to the table is empathy; the willingness to place yourself in someone else's shoes and understand why people make decisions that at first glance appear bizarre. The key to it all are the final shots of the film: the camera pulling back to reveal countless other cars on the road, each one containing a person just like us wrapped up in their own intimate, dramatic and exciting stories. 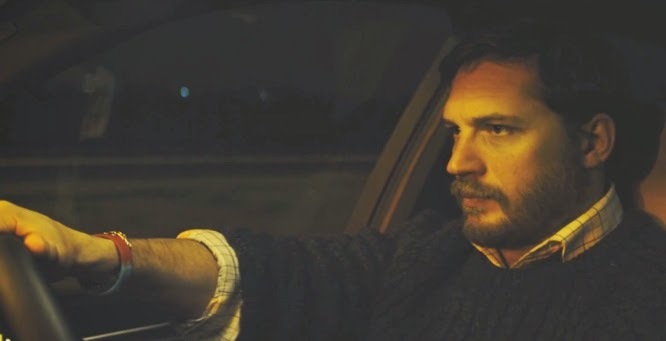 Steven Knight has some balls putting together a film this experimental, but with the crucial component of Hardy's outstanding performance, he has created something truly special. Locke is released on April 18th.